I’ve been freelancing as a web designer for almost 6 years now but only started using Webflow 7 months ago when Adobe announced the end of Muse. What a blessing in disguise that turned out to be. I’ve spent most of that time learning Webflow by converting my old Muse sites (which holy *$%&, I never realized how terrible Muse’s code was ). I’m proud to show off my latest Webflow project which puts all the skills I’ve accumulated over that time together. 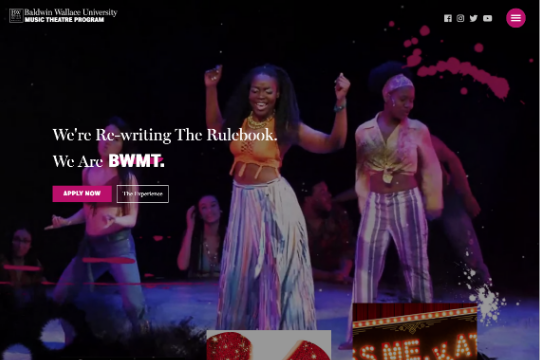 My alma matter, Baldwin Wallace University, contracted me to make a website for their Music Theatre program, which I attended, and It’s very exciting to see my work under a .edu! It’s not perfect but like I said, I’m still relatively new to Webflow. So, if anyone feels compelled to look through my project and offer any suggestions on better ways to style, animate, layout, etc. I’m all ears. This webflow community, while I haven’t posted much, has been a god send and its really because of all of you that this site was finished on time. Thanks Webflow Community! My biggest challenge was dealing with 3D layering. Safari tends to do things differently than Chrome or Firefox so you may see some weird z-index/z-move forward settings. Also, thank you @Okland for https://www.flowbase.co/ Their guides and pre built assets really helped!